Historically, using food grade lubricants meant sacrificing equipment life because conventional Food Grade lubricants could not handle the high stress loads found in industrial equipment or would wash out during cleaning of equipment. 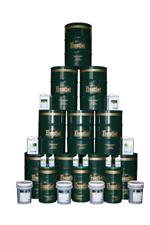 Frontier Performance Lubricants, Inc. is your one stop solution for all your food grade lubricant needs. Our custom made lubricants are formulated to improve equipment performance, reduce downtime, cut operating costs and extend equipment life.Frontier Performance Lubricants, Inc. H-1 food grade lubricants meet the requirements of FDA regulation 21CFR 178.3570, NSF standards for use in operations where incidental contact with food may occur. ALL CLEAN FP is a new generation organic, biodegradable, heavy-duty cleaner and degreaser designed for industrial, automotive, commercial and food service applications. It outperforms harsh soaps, detergents and hazardous chemicals, in hard or soft water. Removes grease, oil, animal fats, food residue and dirt. All Clean Extra is a new generation heavy-duty, water based, synthetic cleaner and degreaser specially formulated for cleaning oily and greasy surfaces. It is environmentally safe, non toxic, non flammable, non corrosive, non abrasive, and biodegradable. ALLYN FG AIR lubricants are specially designed for rotary screw, vane and reciprocating compressors being used in the food service industry. These fully synthetic lubricants are NSF Registered and meet USDA 1998 (H-1) guidelines (lubricants with incidental food contact). Allsyn FG Gear gear oils are specially formulated for gear systems operating in the food service and packaging industries. Food Safe Lubricant may be used as a lubricant, release agent or anti-rust film on equipment and machine parts in locations in which there is exposure of the lubricated parts to edible products. This product is non-toxic, odorless, and tasteless and contains no silicones. Food Safe Silicone Lubricant is a unique blend of food grade silicones designed to lubricate equipment used in the packaging and processing industry. It is specifically formulated to reduce friction and eliminate sticking and binding on metal, plastic, rubber, glass, fabric and laminate surfaces. Food Safe Silicone Lubricant is rated for incidental food contact (H1) on food packaging and processing equipment. It leaves a quick drying, non-staining, pure silicone film that lubricates moving parts and decreases wear and heat by reducing friction of the treated surfaces. PURE GUARD FM FOOD GRADE GEAR OILS are superior quality anti-wear adhesive/cohesive lubricants. They have been specifically formulated for use in equipment where U.S.D.A. H-1 lubricants are specified because of the chance of incidental contamination of food or beverage. They are also intended for use in equipment where the oil may end up in sewers, waterways or other ecologically sensitive areas. PURE GUARD FM FOOD GRADE CHAIN LUBRICANTS are superior quality anti-wear lubricants. They have been specifically formulated for use in equipment where U.S.D.A. H-1 lubricants are specified because of the chance of incidental contamination of food or beverage. They are also intended for use in equipment where the oil may end up in sewers, waterways or other ecologically sensitive areas. PURE GUARD FM FOOD GRADE LUBRICANTS are superior quality anti-wear lubricants. They have been specifically formulated for use in equipment where U.S.D.A. H-1 lubricants are specified because of the chance of incidental contamination of food or beverage. They are also intended for use in equipment where the oil may end up in sewers, waterways or other ecologically sensitive areas. URE GUARD FM SYNTHETIC CHAIN OIL is a premium quality anti-wear food grade lubricant. It has been specifically formulated for use on chains in severe duty low temperature applications where U.S.D.A. H-1 lubricants are specified because of the chance of incidental contamination of food or beverage. 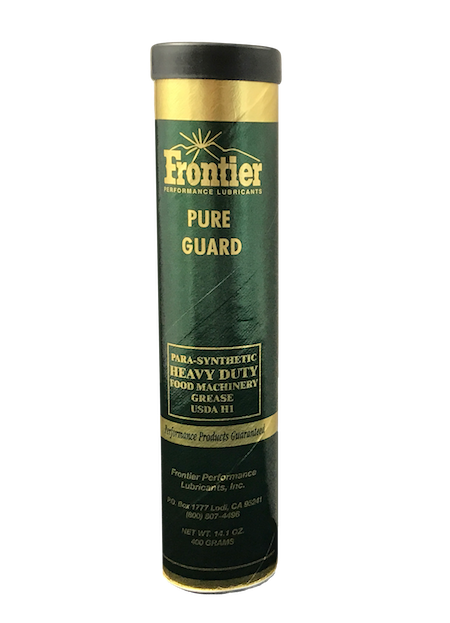 Pure Guard FM Synthetic Food Grade Grease is the first of a new generation of high temperature (620 ºF drop point) food grade greases formulated using state of the art synthetic fluids, additives and base. Its advanced additive package outperforms all food grade, and most conventional greases.